In addition to eating fish twice per week, many dietitians recommend consuming foods rich in alpha-linolenic acid (ALA), a long-chain fatty acid precursor found in plant foods such as ground flax to help boost omega-3 intake. RDs also may suggest supplements if clients and patients can’t consume the recommended amounts through diet alone, have high triglycerides, or avoid fish due to concerns about mercury content or other reasons. To increase omega-3 fatty acid intake, food manufacturers are fortifying eggs and milk with these acids. One omega-3 they’re particularly focusing on is stearidonic acid (SDA), which is expected to appear on store shelves in soybean oil derived from genetically modified (GM) soybeans. Whelan’s review also suggested that SDA doesn’t affect DHA levels, which is in line with more recent studies. “SDA can be converted to EPA and, theoretically, EPA can be converted to DHA,” he explains. “In reality, only DHA changes DHA in the tissues when consuming a typical Western diet,” which is why he doesn’t advocate consuming SDA-fortified foods in place of fish or fish oils containing both EPA and DHA. A second reason SDA likely is attracting the interest of food scientists as a potential source of omega-3s is that it’s less unsaturated than EPA, making it more stable in foods.9 Since SDA is less susceptible to oxidation, “it’s less likely to be prone to ‘off’ flavors,” Whelan says. A limited number of foods contain small amounts of SDA, including some seed oils, such as hemp and Echium; certain fish, such as sardines and herring; and algae. To date, the American diet contains such low amounts of SDA that it hasn’t been measured.8 Of course, if genetically modified, SDA-enriched soybeans and soybean oil hit the consumer market, this may change—and it looks like it will. Richard S. Wilkes, CFS, director of food applications for Monsanto, says the oil was created by inserting an enzyme responsible for increasing the conversion of ALA in soybean oil to SDA, which then is extracted from the seeds. Since soybean oil already is added to various foods, Wilkes considers it an efficient way to bring SDA to consumers. Specifically, it can be used in dairy and soy beverages, dressings, granola bars, margarine-type spreads, mayonnaise, peanut butter, smoothies, yogurt, and yogurt drinks. As of this writing, neither Monsanto nor DSM Nutritional Products has confirmed when products containing the oil will hit store shelves. Who Can Benefit From SDA? Theoretically, the same individuals who rely on ALA-containing foods to increase their omega-3 intake may benefit from adding SDA to their diet. This includes vegetarians, vegans, and anyone else who consumes little to no fish. In practice, turning to food products containing SDA-enriched soybean oil to help clients and patients reach recommended levels of omega-3s may not make much sense, according to Mills. “Overall, too many calories are already coming from dietary fat,” she says, adding that dietary fat consumption in the United States has increased by two-thirds since the 1950s. Based on conversion rates in studies, clients and patients need up to nine times the amount of SDA as EPA to reach recommended intakes, “which means eating a lot of extra fat from oil or getting very little EPA,” she says. It’s important for clients, patients, and consumers to know that if they choose to eat food products containing SDA-enriched soybean oil, it’s a GM product that provides limited amounts of EPA and no DHA. RDs looking for an alternative source of omega-3s for vegetarian and vegan clients and patients can recommend algae-derived supplements containing both EPA and DHA, Vannice says. 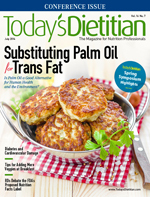 For people who ask whether they should consume products containing SDA-enriched soybean oil to lower their heart disease risk, dietitians can suggest they eat more anti-inflammatory foods and spices containing ALA and phytochemicals, such as cruciferous vegetables, complex carbohydrates, blueberries, turmeric, and ginger, to receive the same health benefits without adding extra fat and oils to their diet, Mills says. “We also can recommend avoiding excess consumption of alcohol, sugar, and refined grains as well as behaviors such as smoking, which all contribute to inflammation,” she says. As new omega-3 fortified foods hit store shelves, dietitians should be prepared to counsel clients and patients about reading ingredient labels to learn the source of these fats. If SDA-enriched soybean oil is listed, dietitians should explain that it’s derived from GM soybeans, and that it may raise EPA levels but won’t provide DHA. For the elderly and pregnant and lactating women, RDs should further explain why DHA is important. For overweight patients and those at risk of CVD, RDs should mention that high amounts of the food product would need to be consumed—along with unnecessary fat and calories—to get significant amounts of EPA. For all clients and patients, traditional sources of omega-3 fatty acids, such as oily fish, fish oil supplements, and algae-derived supplements, still should be consumed to reach recommended EPA and DHA intake. — Amelia R. Sherry is a freelance writer, graduate nutrition student, and founder of the blog FeedingIsla.com. 2. Papanikolaou Y, Brooks J, Reider C, Fulgoni VL 3rd. U.S. adults are not meeting recommended levels for fish and omega-3 fatty acid intake: results of an analysis using observational data from NHANES 2003-2008. Nutr J. 2014;13:31. doi: 10.1186/1475-2891-13-31. 3. Fish 101. American Heart Association website. http://www.heart.org/HEARTORG/GettingHealthy/NutritionCenter/Fish-101_UCM_305986_Article.jsp. Updated February 21, 2014. Accessed April 20, 2014. 4. Vannice G, Rasmussen H. Position of the Academy of Nutrition and Dietetics: dietary fatty acids for healthy adults. J Acad Nutr Diet. 2014:114(1):136-153. 5. Davis BC, Kris-Etherton PM. Achieving optimal essential fatty acid status in vegetarians: current knowledge and practical implications. Am J Clin Nutr. 2003;78(3 Suppl):640S-646S. 6. Burdge G. Alpha-linolenic acid metabolism in men and women: nutritional and biological implications. Curr Opin Clin Nutr Metab Care. 2004;7(2):137-144. 7. Lemke SL, Maki KC, Hughes G, et al. Consumption of stearidonic acid-rich oil in foods increases red blood cell eicosapentaenoic acid. J Acad Nutr Diet. 2013;113(8):1044-1056. 8. Walker CG, Jebb SA, Calder PC. Stearidonic acid as a supplemental source of ω-3 polyunsaturated fatty acids to enhance status for improved human health. Nutrition. 2013;29(2):363-369. 9. Whelan J. Dietary stearidonic acid is a long chain (n-3) polyunsaturated fatty acid with potential health benefits. J Nutr. 2009;139(1):5-10. 10. GRAS notices: GRN No. 283. US Food and Drug Administration website. http://www.accessdata.fda.gov/scripts/fdcc/index.cfm?set=GRASNotices&id=283. Accessed April 12, 2014. 11. DSM Nutritional Products and Monsanto Company partner to deliver first SDA omega-3 soybean oil for use in foods in North America. Monsanto Company website. http://www.monsanto.com/global/uk/newsviews/pages/first-sda-soybean-oil-in-north-america.aspx. Updated April 8, 2013. Last updated May 12, 2014. Accessed April 12, 2014. 12. Forrest LM, Lough CM, Chung S, et al. Echium oil reduces plasma triglycerides by increasing intravascular lipolysis in apoB100-only low density lipoprotein (LDL) receptor knockout mice. Nutrients. 2013;5(7):2629-2645. 13. Surette ME, Edens M, Chilton FH, Tramposch KM. Dietary echium oil increases plasma and neutrophil long-chain (n-3) fatty acids and lowers serum triacylglycerols in hypertriglyceridemic humans. J Nutr. 2004;134(6):1406-1411.